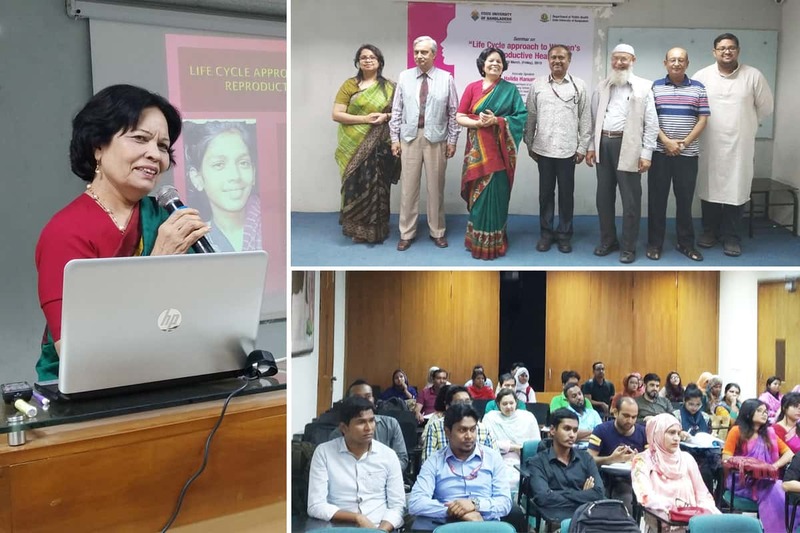 A Seminar on “Life Cycle Approach to Women’s Reproductive Health” was held at State University of Bangladesh (SUB) organized by the Department of Public Health on 29 March (Friday), 2019. The keynote speaker was renowned reproductive health epidemiologist Dr. Halida Hanum Akhter. Dr. Halida was the Chief of Party-USAID-DFID NGO Health Service Delivery Project and Senior Country Director, PATHFINDER INTERNATIONAL. She is currently working as senior faculty at Department of International Health, Johns Hopkins Bloomberg School of Public Health, Baltimore, USA. Ms Nuhad Raisa Seoty, Assistant Professor, Dept of Public Health gave the welcome speech. Honorable Registrar Prof. Maj. Gen. (Retd.) Mohammad Quamruzzaman thanked the resource person and all the participants for attending the seminar. In the main event, Dr. Halida discussed about the sexual and reproductive ill-health, ICPD definition, elements and essential service package of reproductive health, gender violence throughout the life cycle, adolescent health etc. The seminar was ended with vote of thanks by Maj. Gen. (Retd.) Dr. M Shahjahan, adjunct faculty, Dept. of Public Health to the keynote speaker and the participants and concluded the session. Prof. Dr. Anisur Rahman, Principle. State College of Health Sciences, Papia Sultana, Senior Health Education Officer, DGHS, Dr. Nazmur Rahman Sajib, Lecturer, Dept of Public Health and the students of MPH program and other Departments of SUB have participated in the seminar.